When I Google for the definition of Ad tech, this definition by Adobe is the most suitable one that I came across. In marketing language, it refers to all the digital methodologies, you’d use as a marketer to interact, engage and convert. For instance, you could run a display ad (the preferred formats for digital campaigns) on a Google partner site. In marketing language, it refers to all the digital methodologies you’d use as a marketer to interact, engage and convert. For instance, you could run a display ad (the preferred formats for digital campaigns) on a Google partner site. However, Presently, Google Adsense is mostly preferred in case of CPM and CPC campaigns only. And those who plan to leverage digital advertising for acquisition based campaigns are often seen to leverage top Ad Networks to run their ads on a publisher’s site. 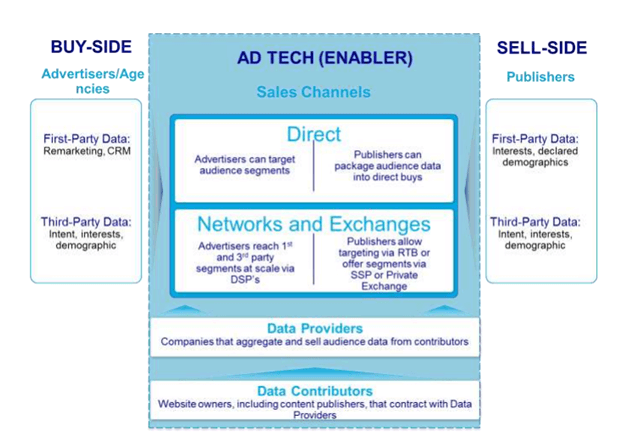 The image below can help understand about all the players of the India ad tech ecosystem. And all these players can help you execute the process of digital advertising. As far as their individual functioning is concerned, you’ll get to know it in just a minute. Advertisers are responsible for planning and executing the entire advertising plan for their clients. Publishers are the one providing ad space and slots on their websites where advertisers can run their client’s ad. Media buyers are a part of the advertising team who negotiates on behalf of their clients. They take care of purchase and monitor advertising space and airtime available at the publisher’s site. A Trading Desk, is a service committed to helping advertisers and agencies buy online advertising. This is done through real-time bidding (RTB), enhanced with data. An example of this is The Media Trader. A DSP is a tech platform that enables buyers to evaluate and bid for online media. And DSP uses RTB for executing this process. For example, MediaMath, Turn, Data XU. 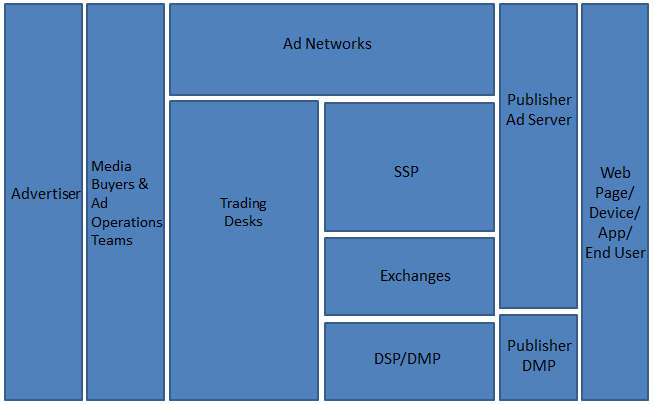 SSPs are tech platforms that help publishers to maximize ad revenues when managing and selling inventory on ad exchanges and networks, for example, Rubicon and PubMatic. An online advertising service provider often with proprietary technology, helps marketers run display advertising campaigns across various sources of online inventory. For example, Google and Yahoo. Furthermore, Adsense is one of the largest global Ad Network. You can read more about Adsense here. These Ad Networks act as a bridge between a marketer (or a media buyer in some cases) and a publisher, thus reducing the complexity of the entire advertising process. Are platforms that allow marketers to manage and understand the vast amounts of data that is constantly being generated by consumers, who are digitizing at a ridiculous pace, for example, Krux. Ad Exchanges are online auction marketplaces that facilitate the buying and selling of inventory across multiple ad networks and demand-side platforms (DSPs), for example, Doubleclick (by Google, Right Media, Facebook Exchange, OpenX). Here is an interactive video of the Arena powered by Rapt Media, of all levels to learn how the different players, parts, and technology work together to create, sell, distribute and measure digital advertising. Grow your website traffic and revenue by spending $0. Start generating additional revenue from Day 1. Get Started. The huge evolution from traditional mass media advertising to digital advertising is no breaking news now. As a result of digitization, people have heard it and found ways to leverage it to the core. Digital advertising has grown to be one of the most effective ways for businesses of all sizes to expand their reach, find new customers and diversify their revenue streams, and India is no exception here. Furthermore, the Indian ad tech industry itself has seen a prominent shift towards a digital conformed culture in the last few years. The industry has evolved a lot, from being a bunch of small scale businesses to a full-fledged industry. As a matter of fact, the second largest growing market in Asia after China is Indian industry. With so many formats like banners, emails, videos, apps, native, social et al, available to establish a perfect communication with your customers, the online advertising system has shown a huge growth and still continues to grow further. And the pace at which startups are innovating in the advertising space is proof that this is a hot sector to be in. Get some insights on the recent Indian ad market development and get more context of what has been happening in the industry. The landscape complexity is born out of the demand of programmatic targeting on the buy side and, yield optimization on the sell-side. The good news: we have more choices than ever. The bad news: we have more choices than ever. This makes it difficult for the right choices to prove themselves. The ad space has really matured over the last year with increased digital budgets and more sophisticated approach towards mobile and digital. One of the prominent changes that can be seen here, is the rise of Ad Networks in India. As mentioned earlier, they evolved in order to reduce the overall complexity of digital advertising. Demonetization, is the biggest news, the hottest topic from the year 2016, thanks to Mr. Modi. As a result of this demonetization, digital payments are becoming more common in the Indian consumer markets contributing to a huge inclination towards “cashless digital economy” (ExchangeWire*). As a result, this has subsequently increased the need for smartphones for efficiency in purchases and thus, more people are buying smartphones. Simillarly, the move towards a cashless, digital economy has created immense awareness not only around digital payments and financial literacy but more broadly, how digital inclusion can result in efficiencies. 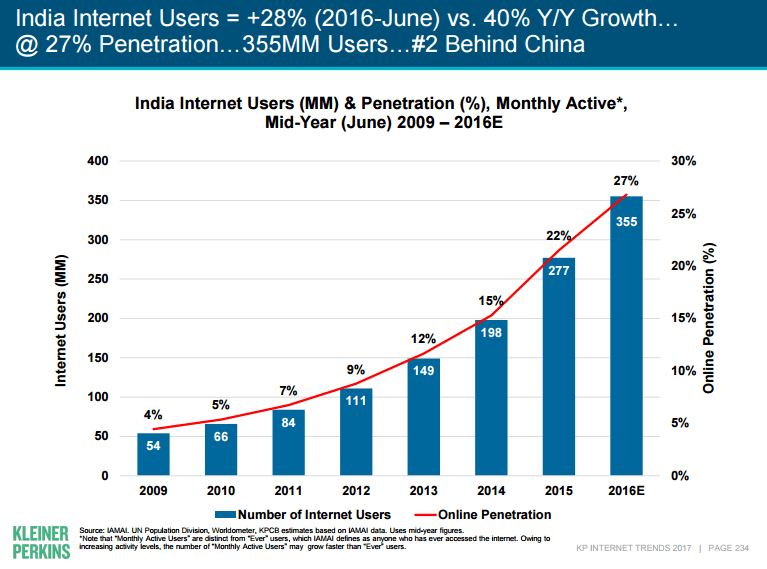 As a result, Internet penetration and smartphone adoption in India has continued to grow. This initiative was estimated as a USD$1tn (£829.75bn) business opportunity, according to a report by Assocham-KPMG in May 2016. The nation’s current 342 million (approx) Internet users and 220 million (approx) smartphone users. This has presented the Indian ad tech sector with plenty of opportunities to engage consumers digitally on mobile and video, as well as reach a wider range of consumers. India is currently the 3rd largest market for smart phones. Furthermore, The consumer base of smartphones particularly is to rise by four-times in the next five years, to 820 million (Livemint). Adblockers defined India’s ad tech space in 2016. At 122 million, India has the second-highest number of people who actively use ad blockers on the mobile web, just behind China’s 159 million. One of the reasons behind it is that the users want to cut the spike in the excessive amounts of garbage ads and thus tends to use ad-blockers most of the time. No doubt more than 60% of smartphone users in India are using such tools. Banner blindness is another major challenge, which India’s ad tech industry is a victim of. There is an element of the ‘conscious vs. subconscious mindset, with consumers subconsciously overlooking and ignoring ads displayed to them; resulting in over 50% of users not clicking on banner ads (ComScore*). Looking for avenues to improve your top-line? Monetize your subscriber inventory with iZooto. Generate additional revenue from Day 1. Get Started. Besides search, native ads make the most sense of all the available options and give a brilliant way to fight banner blindness. 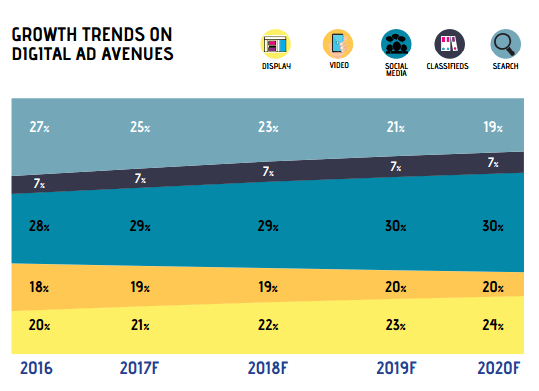 Forecasts that indicate this format, reaching 75% (of total display advertising) in mature markets like the US, make complete sense as of now. But not too clear on where does native work best—social, in-publisher feed, or sponsored content? This is something we still need to figure out. This challenge for online publishing entirely depends on the format of advertising you choose. Mobile Time spent using the mobile browser is more than native apps in developing economies, and India is no exception as local research suggests. Advertising choices on the mobile are thus far more compelling yet terribly complex. The advertising and marketing sector in India is expected to enjoy a good run. A huge growth is expected in retail advertising, on the back of factors such as several players entering the food and beverage segment, e-commerce gaining more popularity in the country, and domestic companies testing out the waters. The rural regions are now getting more focus and will now be seen as a potentially profitable target. For instance, in the automobile sector, the focus of two-wheelers in rural areas could mean more launches and more advertising spends. The telecom sector could see growth as well, driven by better smartphone penetration and service providers cutting down on prices. Due to the emergence of new agencies in the past few years, there has been a battle for a greater market share. This has proven beneficial for the publishers since they get competitive media rates. The coming years will have prominence for marketing and artificial intelligence. It’ll be the time when AI technology becomes mainstream and supports various applications, including data analysis, catboats, personal assistants, and machine-learning in programmatic buying. 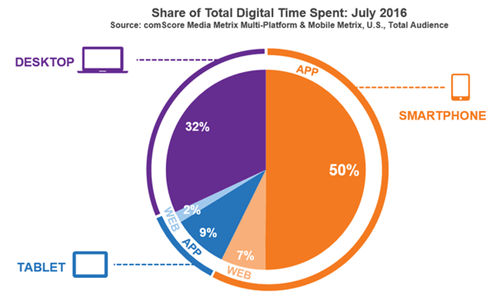 As the number of mobile and internet users is increasing, the future brings into more prominence in digital media in the user’s journey. With data rates going down and speed going up, this will further lead to the higher amount of data usage for various purposes including online research and thus promote digital advertising. As India is expected to hit a ‘mobile tipping point’ this year, mobile web access predicted to surpass all other devices combined by 2018. Video streaming is set to be the next big thing in India along with increased connectivity and more accessible 3G and 4G services. With continuous innovation and upgradations in technology, the driving force will be targeted messaging to increase the digital advertising relevancy. Messages can be targeted with laser focus to very specific groups offering them relevant as well as regional content. Lately, web-based advertising is advancing in India; automated generation of content and putting it out to the universe with the help of technology will promote content marketing and video development. From the advertiser as well as the publisher’s point of view, it is necessary to keep the target audience engaged with the right data from the right source. This strategy plays to the strengths of programmatic advertising. The Internet of Things (IoT), can provide brands with the opportunity to get more user data. Micro-target specific consumers with personalized messages and services. Virtual reality (VR) and augmented reality (AR) technologies allow brands to deliver experiences in new ways and establish emotional engagement. VR can prove to be a fantastic vehicle to deliver storytelling experiences around the brand and reduce distractions. Unlike other communication channels like TV, web, or mobile they do a better job. Brands sat up and took notice of AR because of the success of Pokémon Go. This is used in campaigns to push product trials as well. The technological advances in digital media and the increasing volume of investment in this category, automated. 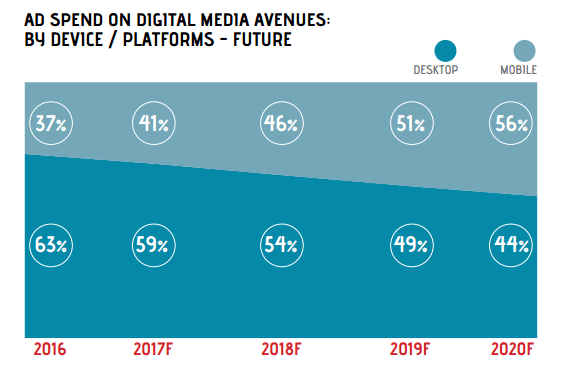 And hence, the content generation and programmatic buying of media will become a norm. This, along with native advertising will increase the adoption of commerce, advertising format among advertisers in the near future. Data analytics drives more communication and media strategies. And this leads to better measurement and improved utilization of spending. Mobile video needs to be a big focus in 2017. Mostly, campaigns that feature mobile video bring in high-quality users who show the greatest engagement. That is why Indian marketers should allocate more budget to this format in the coming year. Unleash the power of native advertising and influencer marketing. It could possibly be a way to overcome the struggle of ad-blocking to an extent. Invest in the right tools and collaborate with the right Ad Network only. See the list of top 80 Ad Networks here. Focus on purpose driven content marketing. Know what their objectives are, who their audiences are, where & when to target, and what they want to see. Marketers must indulge in intent-driven advertisements that target the right users, at the right time, with the right content.